델라웨어 한인 페스티벌은 우리의 최대 명절인 추석을 맞이하여 우리나라의 전통 문화와 현대 문화를 널리 알리고 델라웨어의 한인들이 가족 친지들과 함께 우리의 명절을 즐길수 있는 뜻깊은 행사입니다. 행사 내용으로는 한국 전통 음식 설명, 델라웨어 한국학교 학생들 미술 작품 전시, 포토 부스, 태권도 시범, 사물 놀이 공연, K-POP 댄스 공연 외에도 남녀노소 참여할 수 있는 한국 음식 시식 코너, 김밥 말기 경연, 한국어 배우기 등 다채로운 프로그램이 마련되어 있습니다. 이 행사는 델라웨어 한인회와 델라웨어 아트 뮤지엄이 함께 주관하는 무료 행사이며 많은 한인분들의 아낌없는 후원과 봉사로 2015부터 매년 이어져온 우리의 한인의 행사입니다. 자원 봉사에 관심이 있으신분은 '연락처 > 자원 봉사자 신청서' 나 혹은 delaware@delawarekorean.org 으로 이메일 문의 부탁드립니다. 감사합니다. Immerse yourself in traditional and modern Korean culture through art, music, dance, and food. Enjoy Korean-inspired art activities, a photo booth, Korean snack sampling, TaeKwonDo demonstrations, hands-on activities, and much more. Artwork created by students from the Delaware Korean School will be on display and Korean food will be available for purchase. Free event for all ages. 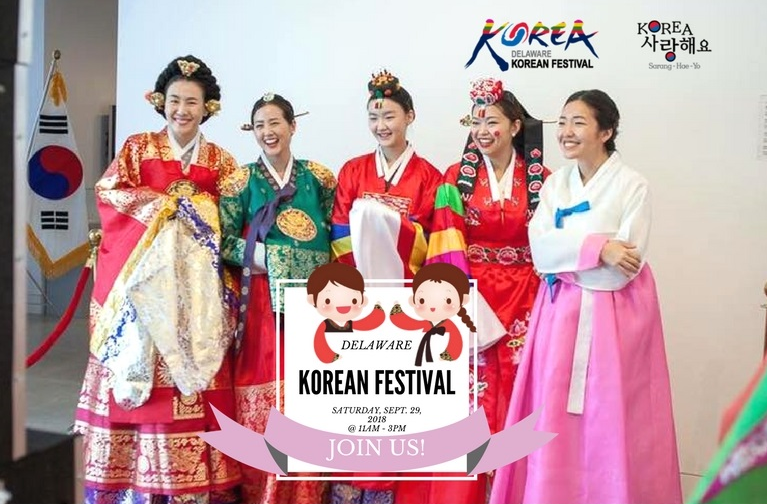 This annual Delaware Korean Festival is held by Delaware Korean American Association and Delaware Art Museum with many generous supporters from the Korean community. Thanks to all supporters and volunteers to make this event successful every year since 2015. 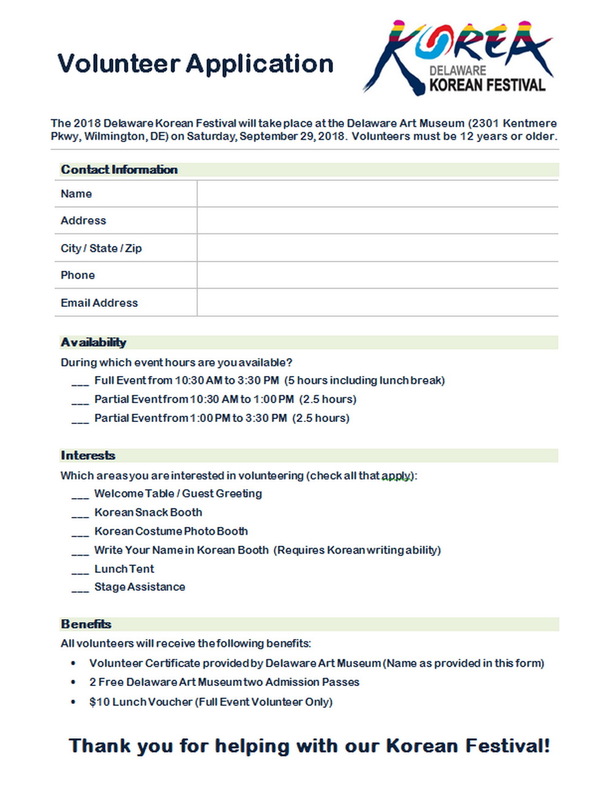 If you are interested in participating in this meaningful event, please let us know under "Contact us > Volunteer Application Form" or delaware@delawarekorean.org. Thank you for your consideration.